New Infiniti for Sebastian Vettel | What Car? 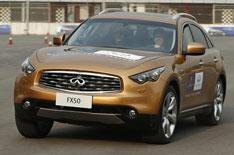 Formula One world champion Sebastian Vettel has taken delivery of his new road car an Infiniti FX50. Vettel, whose Red Bull Racing team is sponsored by Infiniti, took delivery of the car after sampling it during a demonstration run at this year's Chinese Grand Prix. 'It was good to try the car on the limit in the confines of a course laid out at the circuit, and now I have chosen one as my everyday car at home in Switzerland,' said Vettel.